Air-cooled Liquid chillers are required for industrial temperature control applications when no source of water is available for cooling the refrigeration system condenser. These units use fans to dissipate the heat removed by the refrigeration system. 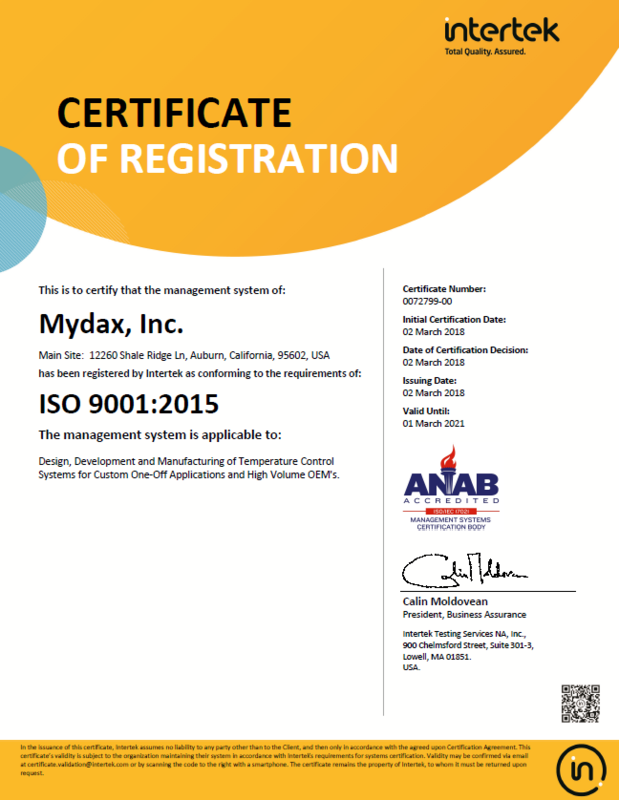 Mydax liquid chiller systems utilize our patented proportional refrigeration control, rugged tubular steel frames and touchscreen controls along with leak free pumps, process fluid flowmeters, stainless steel brazed plate heat exchangers and all brazed copper piping. Each system undergoes rigorous quality assurance testing with system documentation and performance graphs provided. Mydax designs can also include multi channel, independently temperature controlled cooling / heating loop applications where 1, 2, 3 or more recirculating temperature control loops are needed from one liquid chiller system. When cooling requirements begin to exceed 24,000 Btu/Hr (2 ton), the heat being dissipated into a room becomes a concern. At that point we generally suggest either a Water Cooled Chiller or an Outdoor Air Cooled Chiller. Multi Channel Systems for smaller footprint and economical solution for multiple cooling loop applications! Please Note: These are example systems that can be customized to meet your specific needs and other sizes/designs are available. 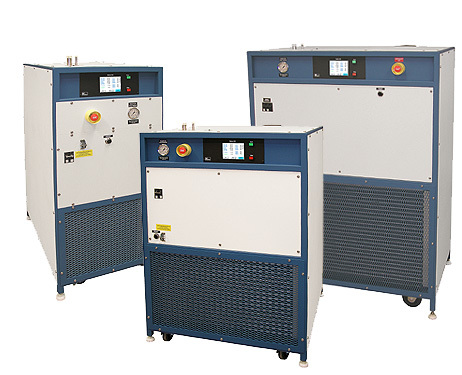 Standard Items: Powder coated Heavy-Duty welded tubular steel frame with aluminum panels; Portable chiller system on locking casters with leveling feet; Stainless Steel brazed-plate heat exchangers; Fluid flowmeter on Heat Transfer Fluid (HTF) return path; Strong all brazed refrigeration and HTF copper piping; High Reliability, Patented Advanced Temperature Control Refrigeration Technology; RS-232 Serial communication interface; 12 Month warranty with free telephone and online support. Optional Items: Ultra Precision temperature control (±0.5°C to ±0.05°C available), Extended temperature ranges; Fluid filtration; Increased reservoir volume size; Sealed reservoir which includes provisions for a Nitrogen blanket on the fluid, pressure regulator and safety pressure relief valve; Variable Frequency Drive (VFD) to precisely meter the output HTF fluid flow; Increased pump size – HTF output flow / pressure; Increased heating capacity; Rotary flowmeter on facilities water return path; Stainless steel or other material HTF piping; Sound Insulation; Digital HTF Pressure Gauge(s); Modbus, GPIB (IEEE-488), RS-485, Ethernet LAN and Analog Input/Output; Special voltages and/or 50 Hz operation; Custom system design, frame size and form factor; Custom system powder coat colors; Outdoor rated system; Extended or onsite warranty; Remote temperature sensing and control; Custom software; UL, CE, SEMI-S2 or other certifications.